THE GOOD - Tense, atmospheric direction from Nicholas McCarthy and an effective lead performance from Taylor Schilling. Disturbed children are nothing new in the realm of horror movies. Ever since “The Bad Seed” introduced the notion of children harnessing evil, audiences have been wary of any kid who seemed too precocious or knew too much about ancient curses. “The Prodigy” is the latest installment in this still fertile subgenre, but sadly, the film offers little that we haven’t already seen. The premise offers standard horror beats in a standard horror setting: child possession in the suburbs. Sarah (Taylor Schilling) gives birth to a baby boy named Miles (Jackson Robert Scott), but as Miles gets older, he demonstrates erratic and unexplained behavior. By the time he reaches 8, this behavior begins to manifest in unsettling ways, including fits of violence and the ability to speak in ancient tongues. Desperate to save what’s left of her son, Sarah investigates the connections between Miles’ birth and the supernatural force that’s overtaking him. I can assure you that the inferences you draw from this premise, with regards to the development of the plot and the resolution, are correct. 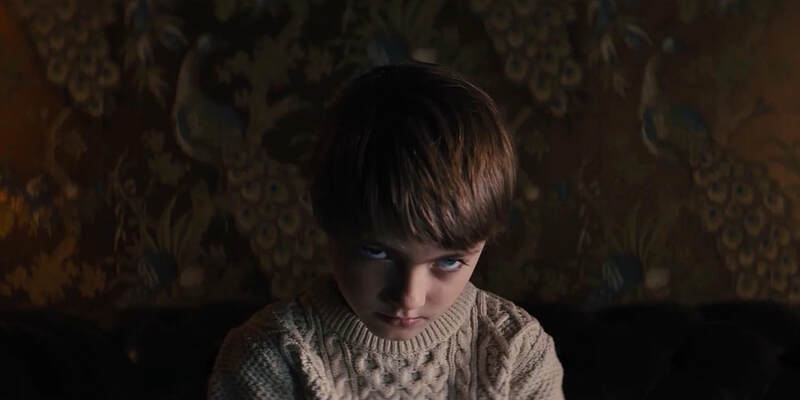 “The Prodigy” doesn’t throw anything at us that we aren’t already expecting, and as long as that’s accepted, it’s an adequate viewing experience. The main pleasures to be had here arrive via Nicholas McCarthy’s direction and his clever staging. Having previously helmed “The Pact” and “At the Devil’s Door”, McCarthy has developed an effective visual tension in his films, placing jump scares in unexpected places and teasing other scares without paying them off. There are countless examples of the latter. We wait for a ghoulish face to appear in a dark space behind Sarah’s head-- it doesn’t, but the space holds our unnerving attention nonetheless. McCarthy understands that the anticipation is what causes us to grip out seats tighter, and he wields this knowledge effectively throughout. Then there is the scene where Miles runs towards his mother in the hallway, only to transform into a murderous adult once he exits the shadows. While this scene was the main selling point for many in the trailer, it's a shame it couldn’t be saved for the film, given its brilliant staging and timing. Little moments like these, where the direction and the established rules of the script coalesce into a creative scare, are what keep “The Prodigy” from slipping into generic schlock territory. Where things start to come apart is with regards to the characters. At times, it feels like McCarthy is trying to recreate the grief-stricken tone that made 2018’s “Hereditary” such a critical darling. But where that film dared to develop its characters and extract fear from their emotional trauma, “The Prodigy” glosses over its central family and is content to leave them as poorly-defined sketches who scream and/or die in horrific fashion. Schilling gives a solid performance as the tortured Sarah, but she’s given so little to play off with regards to the rest of the cast that it feels like wasted energy. A scene between Sarah and her husband John (Peter Mooney) hints at the effective film lurking underneath the more generic beats. They drink in a car on their designated date night, looking back at their hard-partying lives and how they gave it all up to be parents. There are also allusions to John’s history with his abusive father, but neither of these quieter moments are revisited and feel more like filler than meaningful ways of fleshing out the characters. To make matters worse, Jeff Buhler’s script never tells us why these events are happening to this particular family, making it seem as though everything is merely a gory (and contrived) coincidence. The final act toys with a few different horror tropes, as though Buhler is trying to make us guess which door he will open, but his eventual choice proves to be an underwhelming one. Sarah’s journey comes to a bunk conclusion, and the film then races to the credits as though it spent all of the finesse or polish that it had displayed in the first half and had nothing left in the tank. Not a good taste to leave with viewers. As a technical exercise in tension and craft, “The Prodigy” is an effective horror film. As a story with compelling characters and a believable bond between its mother and son characters, it’s a drag streaked with the occasional speck of potential. It’s a competent watch, but don’t expect to remember it by the time you get to your car.